Posted on January 17, 2017 by Eugene Chung / This entry was posted in Informative, New Products and tagged built in silicone jar, ceramic chamber, Dual Quartz Coil, Evolve Plus Pen, rechargeable battery. Bookmark the permalink. The Yocan Evolve Plus is one of the most powerful and durable vape pens on the market. It provides the user with a pure and delicious taste. Simply, deposit wax in the donut chamber and vape to your heart’s content. This coil is made with medical grade ceramic material, which heats up to roast your concentrates on a low temperature. One glob about the size of a tiny marble will vape for approximately 3-15 long and slow draws – dependent on the product being consumed. Overall, the medical effects this pen provides is overwhelming. It hits you as if you just hit a dab from a typical rig with an e-nail. It comes with 1100mah, larger battery capacity, and 15 seconds of continuous heat, making the Evolve Pen more powerful and durable than its predecessors. It includes a built-in silicone jar, which makes it the first multi functional and travelling vape pen in the concentrate market. The battery is rechargeable with a micro USB port. Simply, connect it to a wall adapter or computer by USB cable. The Evolve Plus atomizer coils are crafted with Quartz instead of traditional fiber wick for the purest experience. The Quartz dual coil guarantees a crystal clean and smooth essence. Furthermore, the Evolve Pen comes with a patented coil cap that will prevent thick oil from leaking out and keep your mouthpiece cool. 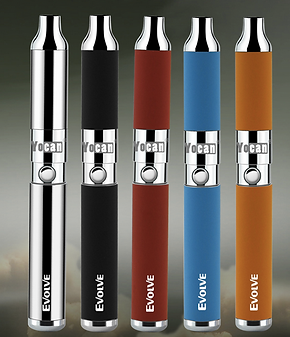 Additionally, the Evolve Pen Plus comes in multiple colors: Black, Blue, Orange, Red, and Silver. If all of these add-ons aren’t enticing enough, then keep in mind that these pens are a jaw-dropping price of 75$. Would 100% recommend this product for its overall efficacy, purity, and PRICE! Order your Yocan Evolve Plus here!